BOB SCHIEFFER: You know, the unemployment figures came out and they were worse thanexpected. BOB SCHIEFFER: As you know. Unemployment actually ticked up to 9.1 percent but this wasjust part of the story. BOB SCHIEFFER: –fifty-four thousand, far fewer than expected. Home prices hit a new low inthe first quarter of the year. Home sales are down again. Consumer confidence is down. And gas and food prices are up. I have to say, congresswoman, many of the experts thought therecovery would be well underway by now. BOB SCHIEFFER: But it looks like we’re going backwards now, that– that we may be on the verge of a double-dip recession here. Do you– do you fear that’s what’s happened? REPRESENTATIVE NANCY PELOSI: Well, I think we have to take a careful look at those figures to see. The unemployment numbers are obviously very disturbing. Are they an anomalyas some people suggest, because of the disasters in the South and the Midwest and the rest or is this something systemic that– that we have to accommodate in a different way? But all of ittranslates into hardship for America’s middle class and they’re feeling it very, very severely. BOB SCHIEFFER: You know Mitt Romney launched his presidential campaign in New Hampshire. And he said basically the President has made the economy worse. Here’s– let’sjust listen to what he said. GOVERNOR MITT ROMNEY: This is now his economy. And what he has done has failed the American people. And the borrowing and the spending and the 1.6 trillion dollar deficit, these–these numbers are his, they’re on his back and it’s why he’s going to lose. BOB SCHIEFFER: So are you and the Democrats going to have to come up to an answer tothat? REPRESENTATIVE NANCY PELOSI: Well first of all, I don’t stipulate to that set of facts thatGovernor Romney just said. Mitt Romney has said because the fact is that this deficit came to us largely from President Bush. But it’s no use going there. We have to go forward. It’s a question of what — what is the President and what are those who aspire to be President going todo about the future to create jobs, good paying jobs. What are they going to do about theeducation of our children, the security of our seniors, the strengthening of the middle class,reducing the deficit– reducing the deficit? BOB SCHIEFFER: But the President has been there two-and-a-half years. BOB SCHIEFFER: I mean, why hadn’t he done that yet? REPRESENTATIVE NANCY PELOSI (overlapping): Well, he’s done a great deal of it. REPRESENTATIVE NANCY PELOSI: I think if he hadn’t taken the actions he did that thesituation would be worse. He pulled us from the brink of a financial crisis, from an economiccrisis. And now we have to dig out of a deep– a– a deep debt. And– and we have to also makeit clear that we’re not getting into this situation again. BOB SCHIEFFER: You were talking in a kind of a different way when unemployment went to five percent under George Bush. What you said then that Americans are struggling with skyrocketing energy prices, gas is only three dollars a gallon then. And you said this morning,this is January 4, 2008, “This morning’s jobs report confirms what most Americans already knew–President Bush’s economic policies have failed our country’s middle class.” I mean, aren’t Republicans entitled to say, you know, if then gas was three dollars and unemploymentwas five percent and– and– and the President has failed the American people, don’t they have a right to say that this President has failed the American people? REPRESENTATIVE NANCY PELOSI: Well, if you want to go into the past, we can talk about the past all you want. The public wants to know about the future. What are you going to do to create jobs, good-paying jobs in our country? BOB SCHIEFFER (overlapping): Well, what are you going to do? REPRESENTATIVE NANCY PELOSI: Well, as I said what the President has done has improved the situation from where it may have been. I also would have either repeated my question about how the Republicans had every right to lay into Obama as a failed president with unemployment at 9.1% and regular gas at $3.85 a gallon??? And when she didn’t bother to answer it a second time, I would have stated for the record that she refused to answer the question. But they don’t let me handle such interviews. Probably because I also would have reached across the table and grabbed her plastic face about the second time after she said “Hm” to the evidence of the devastating failure to the nation her president has been – with most of it occuring under HER House leadership. Unemployment was 7.2% the day Obama assumed the presidency. It’s been over 10%, and now 9.1% and heading upward. 2010 was the worst year in housing – EVER. And 2011 is predicted to be the NEW worst year ever – and yet 2011 got off to such a terrible start that it is incredibly even WORSE than “worst.” The NEW news is that Obama’s bold leadership has resulted in the worst housing market since the Great Depression. So it’s rather difficult to agree with Pelosi’s perspective on THOSE two most major of fronts. In Fiscal Year 2007, Republicans passed their last budget before Nancy Pelosi and the Democrats took over Congress. It had a deficit for $161 billion – which Republicans have openly admitted was way too much. And then the Democrats got their shot. Their Fiscal Year 2008 budget ran a deficit of $459 billion. Nearly THREE TIMES that of Republicans. 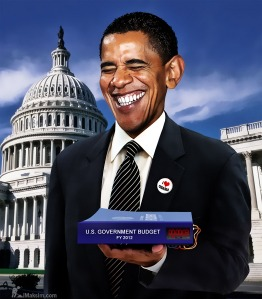 Then there was their doozy of a Fiscal Year 2009 budget, which ran a deficit of a mind-boggling $1.42 TRILLION. Which had never before been seen in the history of the human race – until they topped it the very next year with their Fiscal Year 2010 budget deficit of $1.6 TRILLION. And then they didn’t even BOTHER to try to pass a budget for Fiscal Year 2011 – which was THEIR responsibility. To the extent that the Republicans and Obama are fighting over the budget, it is ENTIRELY the Democrats’ fault. We should have already had a budget for this year, because they should have already passed one last year. Oh, yeah, President Obama – the man Nancy Pelosi so lavishly praises above – had his own budget which he submitted for approval in the Democrat-controlled Senate. And how did messiah’s budget do in the Democrat-controlled environment? It was such a despicable piece of garbage that it failed 97-0 with not ONE SINGLE DEMOCRAT voting for it. That’s not just bad. It is a disgrace. President Obama is a disgrace to America. So between the Democrats not even bothering to pass a budget for 2011 and Obama submitting the worst budget in history, who you gonna blame??? Obviously, Republicans. Because we live in a world that all too largely consists of propaganda. Because, you see, Medicare is just like spending, and just like the budgets that Democrats didn’t bother to pass. MEDICARE IS GOING TO GO BANKRUPT BY 2017 AT THE VERY EARLIEST (I say “earliest” because just recently they were saying it would be going bankrupt by 2019; are they going to revise the demise date forward again?). AND DEMOCRATS HAVE NO PLAN TO FIX IT. It’s going to be just like the Fannie Mae and Freddie Mac fiasco. Republicans tried REPEATEDLY to reform these two housing mortgage goliaths for YEARS before they finally imploded the American economy in 2008. Democrats fiercely resisted every single attempt. As (again) even Bill Clinton acknowledged. They blocked any chance to save the U.S. economy from the disaster that their policies had created years before – going back even into the Carter administration. Democrats created the last mother of all crises (the housing mortgage market meltdown of 2008). And they are already hard at work creating the next one (the impending Medicare implosion). And only YOU can stop them.